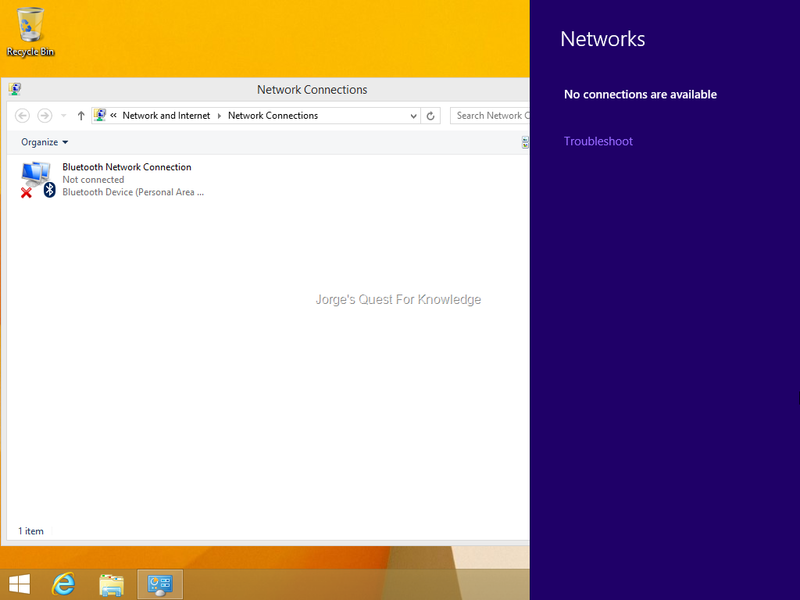 Windows Client « Jorge's Quest For Knowledge! Have you ever needed to script granting or revoking user rights, or maybe just querying for user rights? If the answer is “Yes”, most likely you have had to use NTRIGHTS from the good old Windows Server 2003 Resource Kit or do some funky magic around SECEDIT. 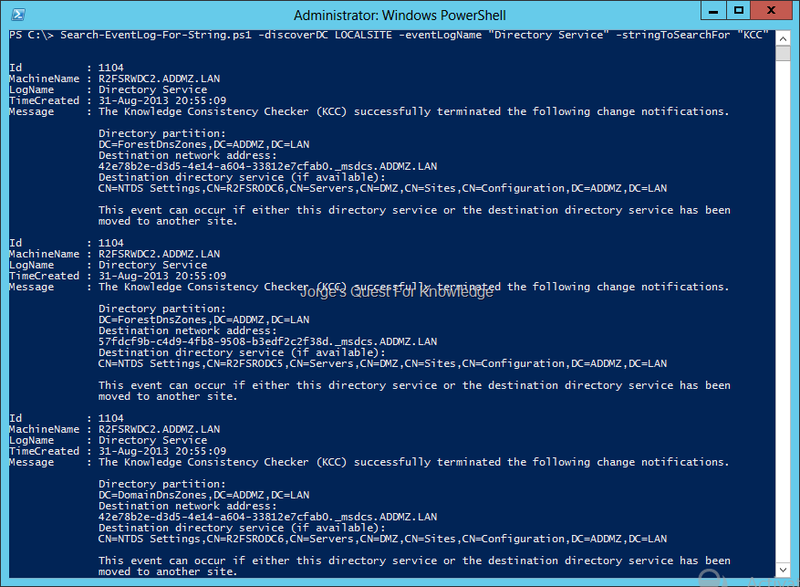 It is a pitty there is no native PowerShell way to manage stuff like this. But, it is a good thing there are MVPs like Tony who has created a PowerShell module that does some interesting things around user rights locally and remotely on Windows systems. 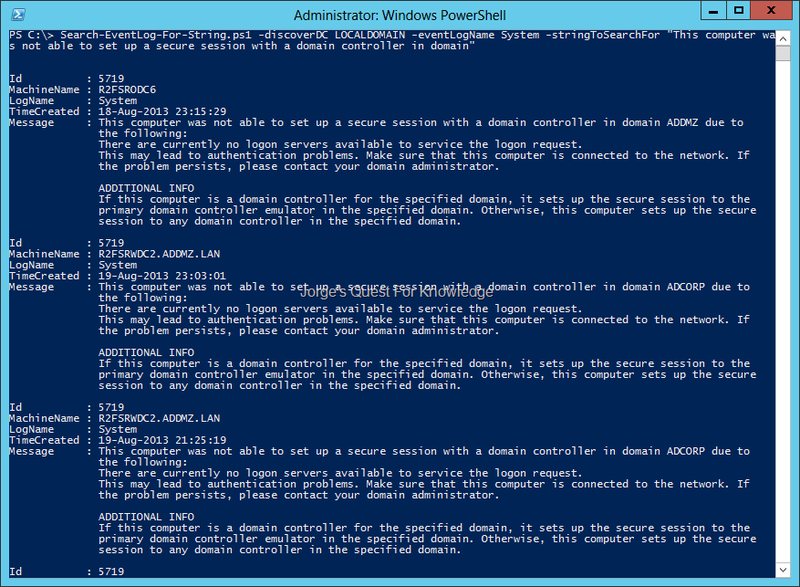 All credits for this PowerShell module of course go to Tony as he build and owns it. The PowerShell Module to manage user rights can be downloaded from here. Can modify any user right; is not limited to "Logon as a Service"
Today I was installing Windows 8.1 Pro in my test environment, which runs on VMware Workstation v9.x. The installation of Windows 8.1 Pro went quite smooth. However, right after the installation, to my surprise I did not have any network connectivity as you can see in figure 1. I have installed WXP, W2K3(R2), WVT, Win7, W2K8(R2), Win8 and W2K12(R2) and none showed similar behavior. I have to admit I did not have the VMware Tools installed. 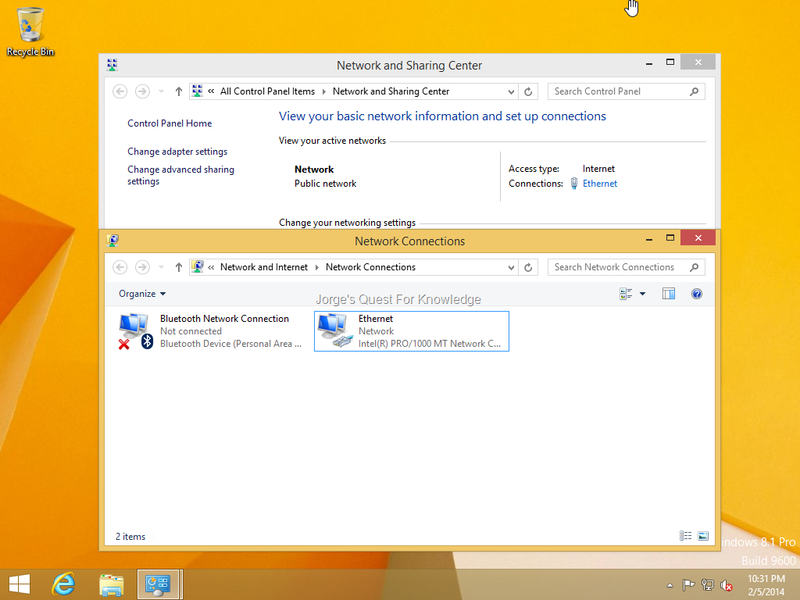 However, after installing the VMware Tools I still did not have network connectivity. That’s weird. It has been years ago I had issues with VMware Workstation in combination with Windows. (2005-12-17) Follow-Up On "It Works On Physical Hardware And It Does Not In VMware Virtualization Software"
After installing the VMware Tools, the VM still did not have any network connectivity. Damn! Now the solution? 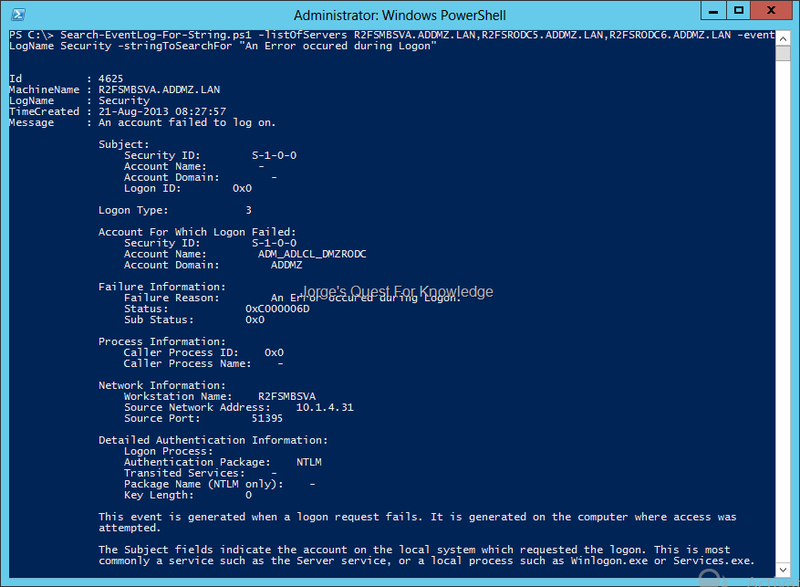 Make sure the VM is shutdown, and not in a saved/resumed stated. 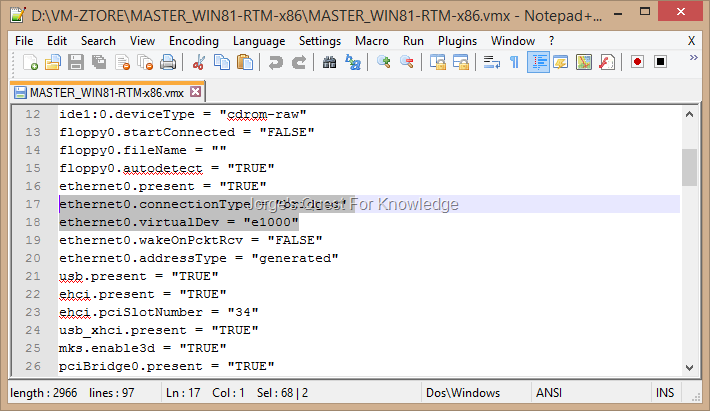 Close VMware Workstation, edit the VMX file and add the two lines, if they are missing somehow. Save and close the VMX file. Open the Windows 8.1 VM again and start it up. Voila! For more details and to download the tools, follow this link. 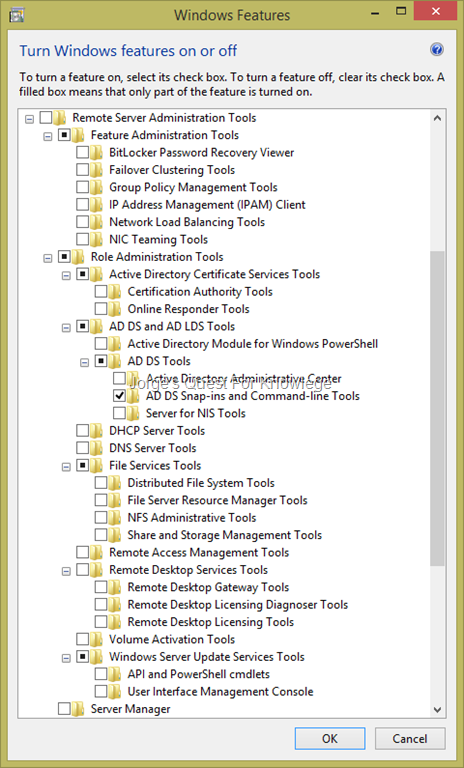 To manage server roles and features remotely on Windows Client 8.1 you need to download and install the Remote Server Administration Tools. After installing the binaries for RSAT you need to enable the tools you want to use through "Program and Features" in the Control Panel. PS: wouldn’t it be very interesting if an RSAT version was made available for Windows RT (Surface)? The guys from the AskPFE Team Blog have written a great follow-up article about the corruption of Active Directory databases in virtualized domain controllers running on Windows Server 2012 Hyper-V host computers. Kudos and credits of course go to the writer of the post on the AskPFE Team Blog. BE AWARE THAT THIS NOW ALSO APPLIES TO W2K8R2 HYPER-V HOSTS AND OTHER HYPER-V GUEST! Make sure you are running on Server class hardware. That means that physical hard drives hosting Active Directory databases and other jet-dependent server roles (DHCP, FRS, WINS, etc) reside on SAS drives as opposed to IDE drives. IDE drives may not support forced unit access that is needed to ensure that critical writes by VM guests get transitively committed through the virtual hosts to underlying disk. Drive controllers should be configured with battery-backed caching controllers so that jet operations can be replayed when the hyper-V hosts and guests are restarted. If Hyper-V hosts can be configured with UPS devices so that both the host and the guest enjoy graceful shutdowns in the event of power losses, all the better. If you feel like the auto-reboot behavior masks the 2e2 or 2e3 boot errors, then disable the “automatically restart” option by going to the advanced tab on system properties under startup and recovery. First, on the Hyper-V host, you’ll need to attach a new disk to the virtual machine. 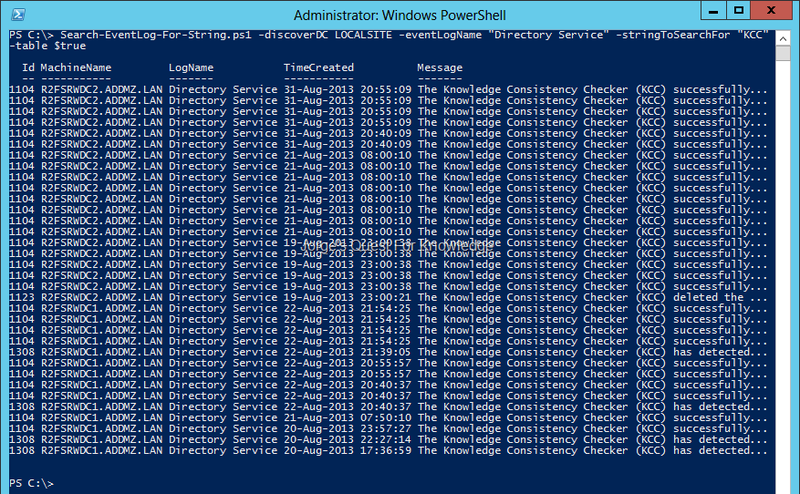 Launch PowerShell as an admin on the host. Pre-identify the VM name and the physical location where you’ll create the new VHDX file. Windows 8.1 RTM and Windows Server 2012 R2 RTM are available today for TechNet and MSDN Subscribers! Have you ever had the need to query multiple computers for a specific string in some Event Log? Well, look no further! 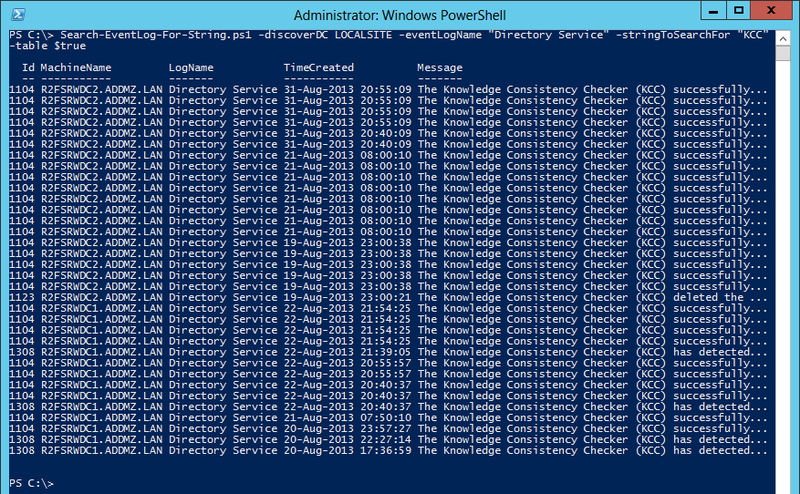 Here is a PowerShell script that does it for you! Search-EventLog-For-String.ps1 -listOfServers R2FSMBSVA.ADDMZ.LAN -eventLogName Security -stringToSearchFor "An Error occured during Logon"
Search-EventLog-For-String.ps1 -listOfServers R2FSMBSVA.ADDMZ.LAN,R2FSRODC5.ADDMZ.LAN,R2FSRODC6.ADDMZ.LAN -eventLogName Security -stringToSearchFor "An Error occured during Logon"
Search-EventLog-For-String.ps1 -discoverDC LOCALDOMAIN -eventLogName System -stringToSearchFor "This computer was not able to set up a secure session with a domain controller in domain"
Search-EventLog-For-String.ps1 -discoverDC LOCALSITE -eventLogName "Directory Service" -stringToSearchFor "KCC"
Today I watched a very interesting presentation about “Pass-The-Hash” and other credential theft and reuse scenarios. In addition to the presentation, there is also a document with more detailed info. WARNING: DO NOT USE THESE TOOLS IN ANY PRODUCTION ENVIRONMENT! ONLY USE IT IN YOUR ISOLATED TEST ENVIRONMENT AFTER APPROVAL!! !